Yesterday was the big day: I finished up the semester... and I can declare success for what is always my most important goal — all the students passed! As always there were a few students who struggled all semester, and it's not always easy to figure out how I can help help (since it is, after all, up to them in the end), so I am really happy for how everything turned out! A semester of changes. This was also a semester where I made a lot of big changes to the class, and they all worked out really well! I'm always tinkering in little ways with the classes, but this year I faced a 20% increase in students (budget cuts at my school), which I found out about, luckily, way back in the spring. That meant I could spend the summer really thinking hard about the changes I could make to my class. If I were going to be making 20% less effort per student (which is one way to understand that enrollment bump), how could I redesign the class in ways to make sure that the students would still have a great experience, driving their own learning and just relying on me to set them in motion and then keep them moving all semester long? So, in this blog post — which I am going to call #ReflectBlog as part of a new project here for Canvas that I will write about separately — I'll choose the three changes feel like real successes, and then in the spirit of true reflection, I will also explain a failure and what I learned from it too. But first, the successes that I am really happy with, one of which is not Canvas-related, but two of which are connected with Canvas, yay! 1. MORE REVISION. Revision has always been part of the process in my classes; you can see how that works in this overview page for the Semester Projects. The biggest change I made this semester was to expand on the number of weeks students spend revising and also on the number of Editing Challenges that I present to them. Students get detailed (VERY detailed) comments back from me on their writing, plus feedback from other students, but the most important thing (as I see it) is an editing challenge that they choose for themselves each time they work on a revision assignmen. You can see how the revision assignments work here, and here is the list of editing challenges. This turned out so great! The students were so happy to have the chance to continue to improve their writing, and they were also more adventurous in the challenges that they chose since on the second week of revising, they usually had fewer technical and mechanical things to adjust and could be more exploratory in their revising. One of my favorite new challenges was about "reading with a friend" where they would share their writing with a friend and get feedback. That turned out to be so affirming! Sometimes it was a roommate right there, but one student even Skyped with her mom in order to share her work and brainstorm. I thought that was so cool! So, the students had a better learning experience, and it was at the same time how I managed my increased workload, since commenting on revision assignments that come in takes less than half the time than a first-round set of comments. blogs, and I am so happy with the student-to-student presence that these two new class pages created, all automated, so literally no extra work for me of any kind. The blog RSS runs itself, and I just bookmarked new website pages as assignments came in which added them to the class project streams. Easy-peasy! There are lots of other changes I made this semester that worked really well, but now that I look at this list, it is not really hard to say that those were the three changes that I think were best for the students and best for me all at the same time. And now... the failure. In October, I was invited to go to Creighton University to help with a course on Aesop's fables being taught by Father Greg Carlson, a long-time friend online whom I had never met in person; the Carlson Fable Collection features over 8000 books of Aesop's fables from around the world (details here). When Father Carlson contacted me about this, I was so excited, and spent the summer building a new English-language Aesop website that I hoped would be useful to his students. It was a great adventure, and I am really happy about that; it's a project I will continue to work on for years to come: Aesop's Books. So, that's a success, but here's the failure: I was in Creighton for one meeting of the class, and I honestly had no idea what to do! The idea of crafting a learning experience that was based on people being in a barebones room (with awful seating, you know what many college classrooms are like) for 50 minutes... strangers to each other, with me having really no idea of what the students were interested in, what they knew, what they wanted to know... eegad, I was lost! So, I did an okay job I guess, but when I think of all the trouble and expense that Father Carlson went to in order to bring me there, I still wanted to do something really excellent. And it was not really excellent, based on the fact that only two students contacted me later on with questions and follow-up to help them with their class projects. ReflectBlog. I got this idea for #ReflectBlog after reading something by Stephen Simpson here last week. 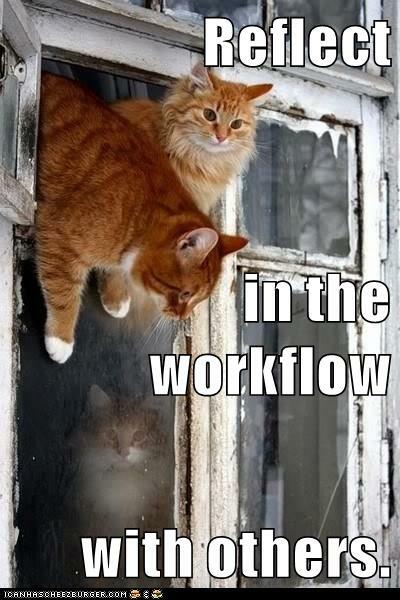 Blog post: Reflect in the workflow with others.